Designed by the Ippolito Fleitz Group, who are known to go beyond the simple architectural and interior vocabulary and get under their client’s skin; (they create projects that are part of the whole yet distinctly unique), WakuWaku stands for an ecologically sustainable philosophy and the comprehensive use of untreated wood communicates this message upfront, albeit subtly. The 145 sq. 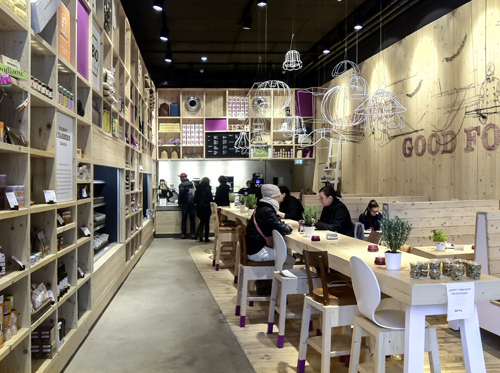 m. long, open format provides a vibrant and spacious café-like feel to the space. In the centre lies a lengthy table punctuated by different shapes of chairs providing visual relief. Interestingly, the chair legs are dipped in violet, which is the restaurant’s corporate colour – giving them an instant connection. 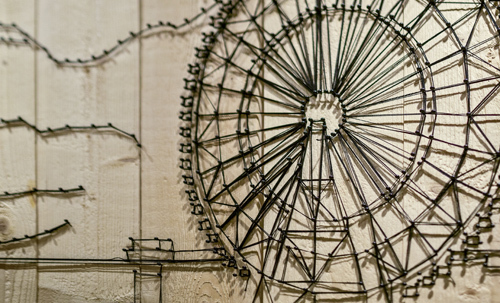 Rough wooden surfaces are juxtaposed against intricate wall sketches created by Chris Rehberger using taut strings and a canopy of fine wire lamps that resemble quirky-shaped spider webs and make for some very unusual pieces of art. 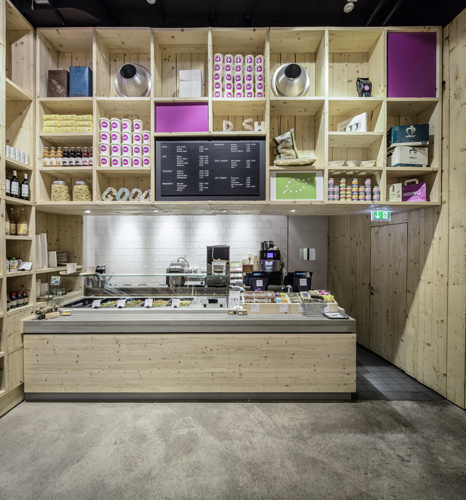 Solid floor-to-ceiling wood paneling creates a stage for displaying food products in the WakuWaku world. 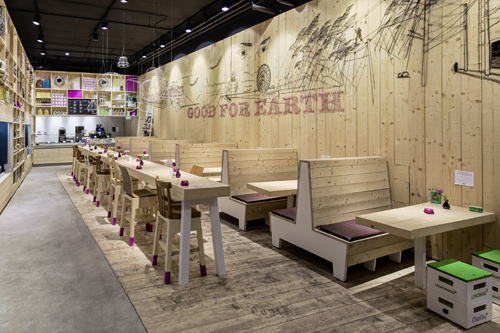 On the opposite side lies bench seating in continuity with the rest of the décor set against a backdrop of a wooden paneled wall, which displays text ‘Good for the Earth’ – the only direct reference of its philosophical statement. 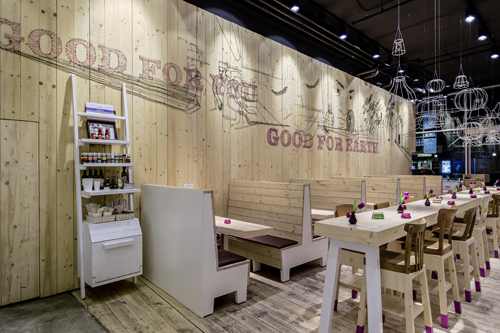 Rustic wooden panels partially cover the flooring, while their signature ladder-shelf urges one to try out some of their irresistible goodies.